Lock in a great price for El Paseo Hotel – rated 8.6 by recent guests! Clean. SpaciousNice to have a larger fridge and kitchenware. Great lounge with state of the art Italian coffee machine. Loved the location and the friendly people .. coffee was excellent and and the wine at HH was very nice too . Would definitely come back. Location was super fun. Room was beautifully decorated and extremely clean. The 2nd floor relaxing and coffee room was very enjoyable. The staff was extremely pleasant and helpful. Loved the overall décor. The breakfasts are consistently good and the service is superb. The servers are particularly attentive and beyond criticism. I love the ambience of Espanola Way and hope to return next year. Wonderful location! Charming little boutique hotel. Location is awesome. Everything within walking distance. Just wonderful. Location, quiet room, 15% discount on Española Way restaurants. Location was amazing. Near Lincoln Road and near the beach. Staff was very friendly. The staff was wonderful and could not have been more helpful. They went out of their way to make our stay enjoyable. El Paseo Hotel This rating is a reflection of how the property compares to the industry standard when it comes to price, facilities and services available. It's based on a self-evaluation by the property. Use this rating to help choose your stay! One of our best sellers in Miami Beach! 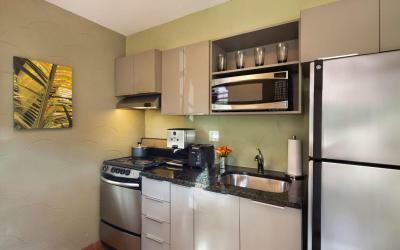 The boutique El Paseo Hotel is inspired by Spanish and Mediterranean design and offers accommodations with free WiFi. Each room features a 45-inch flat-screen TV, electronic safe, and ironing facilities as well as a private bathroom with a hairdryer. Select suites feature a balcony. On-street parking, dry cleaning services, and a 24-hour front desk are available for guests' convenience. When would you like to stay at El Paseo Hotel? This room features a flat-screen TV, small refrigerator, and tiled bathroom with a walk-in shower, toiletries, and bathrobes. A separate living area with a full-size sofa bed and a flat-screen TV, a fully equipped kitchen, and a tiled bathroom with a walk-in shower, toiletries, and bathrobes are featured in this suite. A view of Española Way or Drexel Avenue can be enjoyed. This suite features a separate living area with a full-size sofa bed and a flat-screen TV, a fully equipped kitchen, and a tiled bathroom with a walk-in shower, toiletries, and bathrobes. Featuring a view of Española Way, this suite has a separate living area with a twin-size sofa bed and a flat-screen TV, a small refrigerator, and a tiled bathroom with a walk-in shower, toiletries, and bathrobes. House Rules El Paseo Hotel takes special requests – add in the next step! El Paseo Hotel accepts these cards and reserves the right to temporarily hold an amount prior to arrival. The resort fee is a taxable amount. The tax will be charged by El Paseo Hotel in addition to the total amount. The parking fee is a taxable amount. The tax will be charged by El Paseo Hotel in addition to the total amount. Please note the property will make a credit card authorization for incidental charges, which will be released back to the guest upon check-out. Please contact your bank, as credit card authorizations made by properties may take 5 business days to have reflected back depending on banking institution. A nonrefundable, USD 250.00 fee will be charged for smoking in guestrooms. Had to go outside our section of hotel to get to main building. We didn’t find anything we didn’t like. Very inconvenient location if you have a car. The hotel does not have elevators. There was one single step outside my room door and I tripped and fell on it my first day there. There’s no elevator, and they let you drag your own luggage up 2 floors. Also no breakfast. Coffee machine in room . Excellent location, close to beach, shopping areas and restaurants. Friendly staff, eager to solve problems on day of arrival, by providing a more suitable room. Wonderfull experience! Best location, best staff! Spacious! Floors quite dirty, feet were all black when walking barefoot in room — need to mopped more often. Strong scent of paint in room, strong scent of cleaning product in lobby, thumping music at night. Expensive for what it is. There are no enough hangers to hang clothes, nor water to drink available in the room. There a lot of coming noise of the street and of the restaurants. no advisable for more than two nights.